"35 percent said the Libertarian Party best reflects their views, and 23 percent said the Democratic Party best reflects their views. Only 30 self-identified libertarians, a mere six percent, felt the Tea Party best represented their views. That was only slightly less than the Republican Party, which captured 9 percent of self-identified Libertarians. 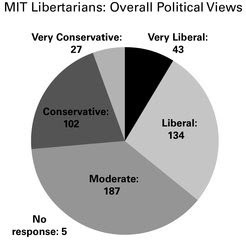 A plurality of those who said that they considered themselves to be libertarians called their overall political views “moderate” -- about 38 percent." I like your pictorial Nolan Chart. Too bad it doesn't plot the questions along it as "points" like his did. I want to see one with 200 or so nuanced questions. It would also be interesting to see one with a vector for anarchists that tugs a dot around the outer perimeter, closest to the anarchist "off the map" dot. (Useful for anarcho-socialists or "anarcho-syndicalists" / nihilist-collectivists). It might also be interesting to have chronological curve, plot motion to the dots. 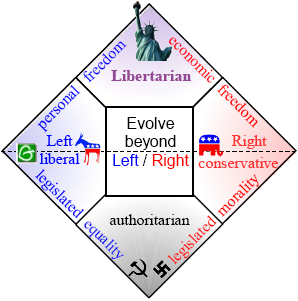 Before the fall of the state, sometimes people are libertarians, after the theoretical fall of the state, they might suddenly shift to being collectivists. Liberal anti-prohibitionists might fall into this category, where ending the corrupted state is simply a desired means of correcting the state's functions.